President Paul Kagame joined the Ethiopian people to mark the 40th anniversary of the Tigray People's Liberation Front (TPLF), a key partner in the ruling coalition and one of Africa's oldest liberation movements. Speaking an event in Mekelle, Kagame hailed the cordial ties between Rwanda and Ethiopia, referring the Horn of African nation as a valued partner of Rwanda. The Rwandan leader paid tribute to former Ethiopian prime minister Meles Zenawi, one of the founders of TPLF, whom he described as a hero. Zenawi, the former charismatic leader of the ruling Ethiopian People's Revolutionary Democratic Front (EPRDF), died in August 2012 aged 57. "You faced the military might of superpowers. Famine was used against your people, as a weapon of war. Your national unity was under constant assault. But nothing could break the Ethiopian spirit, and you have not only prevailed, but continue to thrive," Kagame said, in reference to TPLF. The President said Ethiopia's success has great meaning beyond its borders because of how the country has addressed its problems. "You never wavered in your commitment to build a robust national unity that is, at the same time, firmly anchored in Ethiopia's remarkable diversity. As a result, Ethiopia is peaceful, stable, and increasingly prosperous," he said. He pointed out that Ethiopians have always maintained a principled commitment to self-reliance in all forms: economic, political, and above all, intellectual. 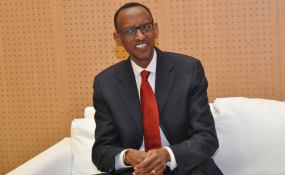 President Kagame also criticised foreign groups which he said assume they can care more about Africans than Africans themselves, adding that such actors were intent on imposing solutions and more often attempt to silence African leaders. "Ethiopia has never kept quiet. You have charted your own course, based on a deep analysis of your history and circumstances, and stayed the course. The result is the enormous growth we see today in Ethiopia, while you move rapidly towards a future as a middle-income country," Kagame added.